MediaVacationRentals: cheaper vacation rentals, with no commission and more security. Why are our rentals cheaper? Quite simply because we specialize in commission-free owner direct rentals with a very small broker’s fee (cost of the listing for the owner, which was less than 1% of the rent in 2013). MediaVacationRentals.com is funded by an annual registration fee paid by the owner, which represents less than 1%* of the rent and therefore has no impact on it. Owners that still have availabilities during the season may offer discounts ranging from 10 to 50% from an already low price. Visit the Promotions & Last Minute Offers page. For MediaVacationRentals.com, our owners and renters security is a top priority for us. The site uses sophisticated tools and reliable procedures for highly effective results against suspicious or fraudulent behavior. Are the listings on MediaVacationRentals.com verified? We don’t actually visit the properties ourselves. Instead, we use cutting edge software and manual control processes to check the legitimacy of the online ads. In some cases, we may get in touch with a solicitor or local officials to check out the property or the owner’s identity. While these tried and tested methods have ensured the reliability and quality of MediaVacationRentals.com, we have to be continually vigilant, as always on the internet, and respect a few basic security rules. they send you some form of identity when you haven’t asked for it. We want to ensure that our customers continue to use our service, and have absolutely no interest in acting as a platform for misleading listings. That is why we have set up a highly effective quality control process, based on the information (reviews) that the renters are systematically invited to send us. This quality control process means we can guarantee a high level of rental quality. Many websites simply post the different negative reviews with varying degrees of accuracy. Our site follows the quality process through to the end! We systematically launch a quality control process if there is negative feedback about a rental (negative review, phone call, e-mail, etc.). We check the nature of the criticisms made about the rental and get in touch with former guests. If necessary, we introduce corrective measures. In the event of a serious problem (e.g. : non compliant electricity, deliberately misleading listing, repeated management failings): the listing is removed. Problem requiring action by the owner (e.g. : obsolete equipment): owner asked to improve the situation and information given to potential renters, which will only be removed when proof of improvement has been sent to us by the owner (invoices). The strict application of this exclusive policy for over 15 years means that the rentals we offer are of the highest standard. Our owners are serious renters who understand our demanding conditions and are happy to accept them. For MediaVacationRentals.com, the legitimacy of positive reviews is extremely important. Consequently, we have set up a strict and highly controlled review posting procedure. MediaVacationRentals.com does not have a “Leave a review” button, for instance. That’s why, although there may not be a lot of reviews on MediaVacationRentals.com, they are very reliable. Why are MediaVacationRentals.com rentals better equipped? Using the mailbox means that your messages to the owner remain securise. The system tells you when your messages have been read for safe and faster bookings. All the documents sent are checked first to ensure there are no viruses. MediaVacationRentals.com automatically adapts to your support platform and automatically changes to your smartphone or pad. You can access tens of thousands of owner direct holiday rental offers and hundreds of special offers... all in the palm of your hand. 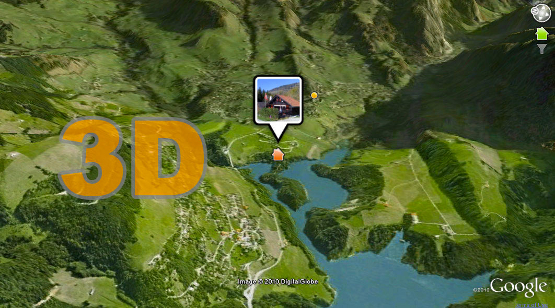 MediaVacationRentals.com is the only website with a 3D bird's eye view of the rentals so you can discover all the surrounding area: beach, forests, trails, etc. 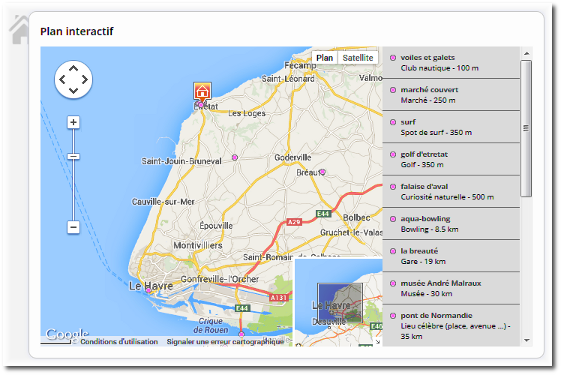 The interactive map enables you to discover the distances between the rental and the main centres of interest. For around 4% or 5% of the listings on our site, the renter benefits from a multirisk insurance policy especially designed for vacation rentals. More information. To stay updated on all the latest last minute deals and get the best bargains, click here.